FC Barcelona announced on Tuesday a regional sponsorship agreement with the National Bank of Ras Al Khaimah (RAKBANK), making them the Official Bank of the Club in the United Arab Emirates for the next three years, with the option of an additional two years. The signing of the agreement became official on Tuesday in an event that took place at the Presidential Box at the Camp Nou attended by FC Barcelona’s CEO Òscar Grau and RAKBANK’s Managing Director of Personal Banking, Frederic de Melker. The agreement includes the launch of new products with a shared brand across both entities, including MasterCard Platinum debit and credit cards. 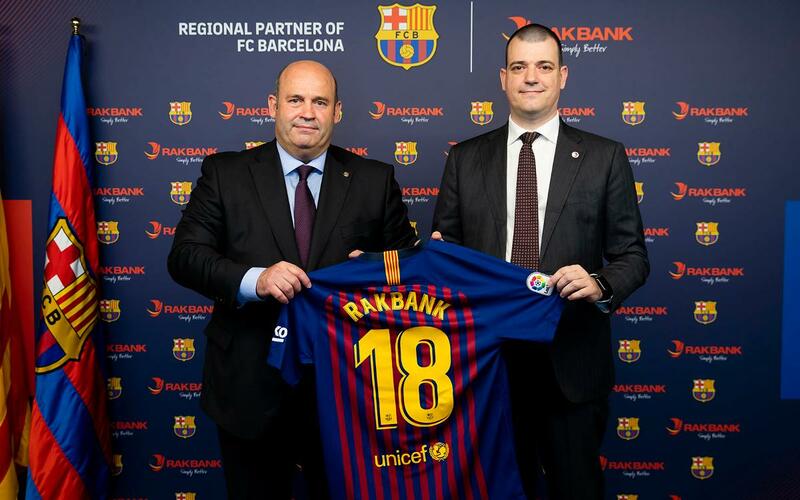 Moreover, the RAKBANK clients who are Barça fans will be able to access the Club’s products and will have opportunities to watch their favourite players at matches in Barcelona, among other advantages. RAKBANK, also known as The National Bank of Ras Al Khaimah (P.S.C), is one of the UAE’s most dynamic financial institutions. Founded in 1976, it underwent a major transformation in 2001 as it rebranded into RAKBANK and shifted its focus from purely corporate to retail and small business banking. In addition to offering a wide range of Personal Banking services, the Bank increased its lending in the traditional SME, Commercial, and Corporate segment in recent years. The Bank also offers Islamic Banking solutions, via RAKislamic, throughout its 38 branches and its Telephone and Digital Banking channels. RAKBANK is a public joint stock company headquartered in the emirate of Ras Al Khaimah and listed on the Abu Dhabi Securities Exchange (ADX).